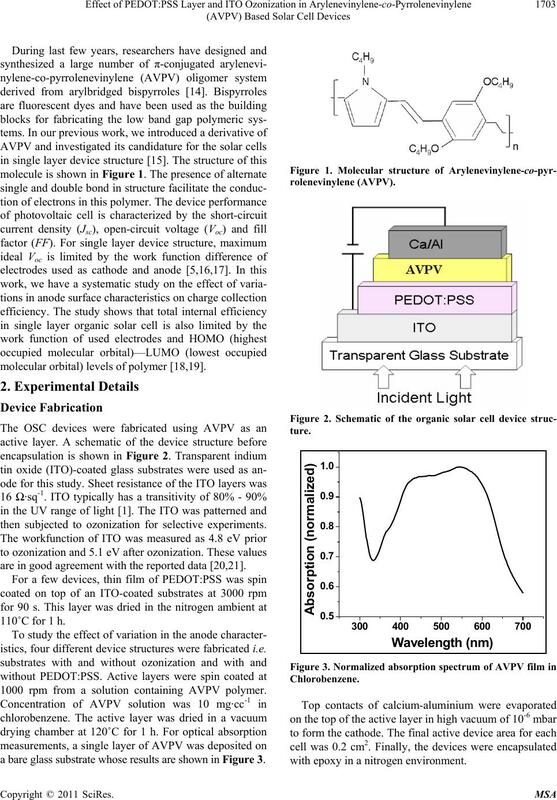 Received September 26th, 2011; revised November 1st, 2011; accepted November 17th, 2011.
ters on the anode surface treatment in an organic single layer photovoltaic device based on AVPV as an electron donor . illumination of AM 1.5 through a calibrated solar simulator. are ecologically favourable is required. the polymers with respect to other layers in the device. trode degradation as reviewed by Jorgensen et al. .
molecular orbital) levels of polymer [18,19]. then subjected to ozonization for selective experiments. are in good agreement with the reported data [20,21]. istics, four different device structures were fabricated i.e. 1000 rpm from a solution containing AVPV polymer. a bare glass substrate whose results are shown in Figure 3.
with epoxy in a nitrogen environment. 1.5 through a calibrated solar simulator. absorb sunlight towards lower wavelength. 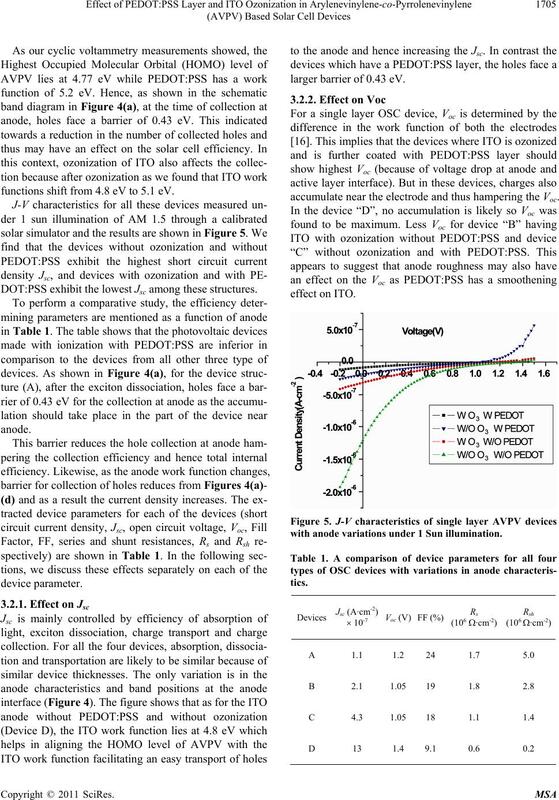 each of these device structures are shown in Figure 4.
the work function of ITO, as well as use of PEDOT:PSS. without ionization and without PEDOT:PSS. functions shift from 4.8 eV to 5.1 eV. DOT:PSS exhibit the lowest Jsc among these structures. larger barrier of 0.43 eV. accumulate near the electrode and thus hampering the Voc. with anode variations under 1 Sun illumination. Solar Cells, Vol. 8, No. 1, 1983, pp. 47-83. Z. He, C. Zhong , X. Huang , W. Y. Wong, H. Wu, L.
Vol. 23, No. 40, 2011, pp. 4636-4643. Overview,” Journal of Materials Research, Vol. 19, No. E. Soto, J. C. MacDonald, C. G. F. Cooper and W. G.
Journal of the American Chemical Society, Vol. 125, No. Reviews, Vol. 107, No. 4, 2007, pp. 1324-1338. P. W. M. Blom, V. D. Mihailetchi, L. J. A. Koster and D.
No. 12, 2007, pp. 1551-1566. Nanorod-Polymer Solar Cells,” Science, Vol. 295, No. mistry, Vol. 67, No. 12, 1995, pp. 1983-1990. Solar Cells, Vol. 91, No. 11, 2007, pp. 954-985. 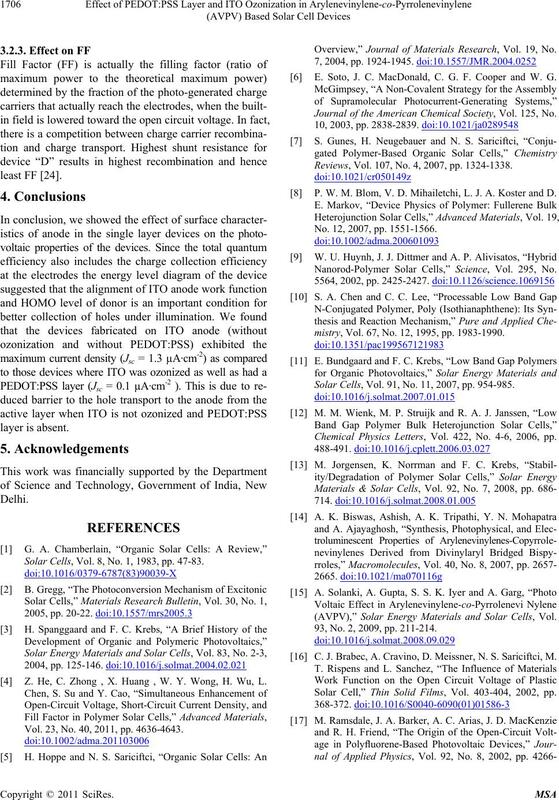 Chemical Physics Letters, Vol. 422, No. 4-6, 2006, pp. 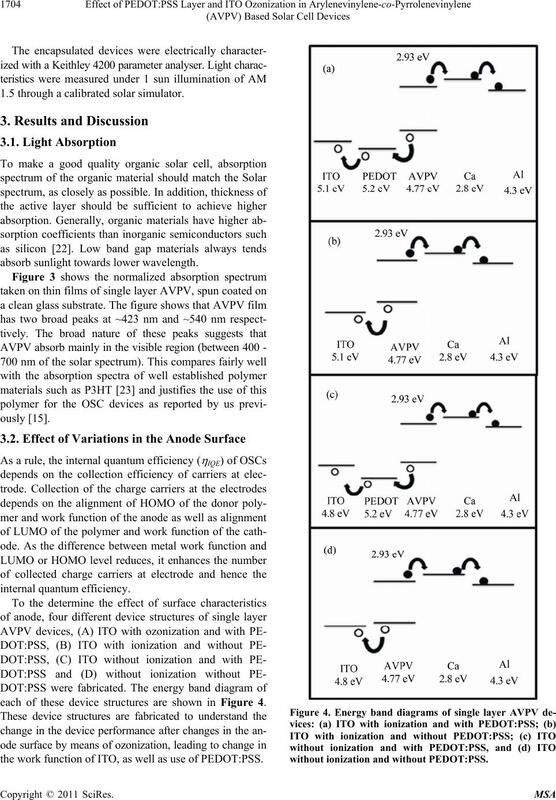 (AVPV),” Solar Energy Materials and Solar Cells, Vol. 93, No. 2, 2009, pp. 211-214. 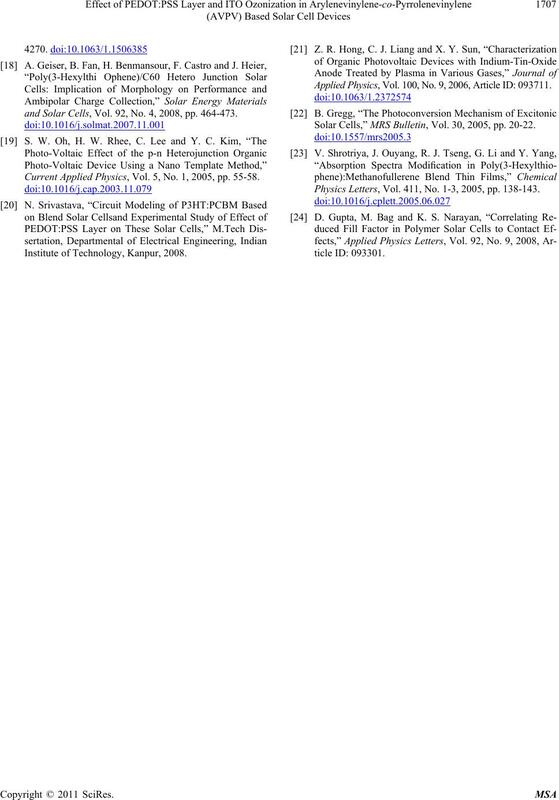 C. J. Brabec, A. Cravino, D. Meissner, N. S. Sariciftci, M.
Solar Cell,” Thin Solid Films, Vol. 403-404, 2002, pp. and Solar Cells, Vol. 92, No. 4, 2008, pp. 464-473. Current Applied Physics, Vol. 5, No. 1, 2005, pp. 55-58. Institute of Technology, Kanpur, 2008. Applied Physics, Vol. 100, No. 9, 2006, Article ID: 093711. 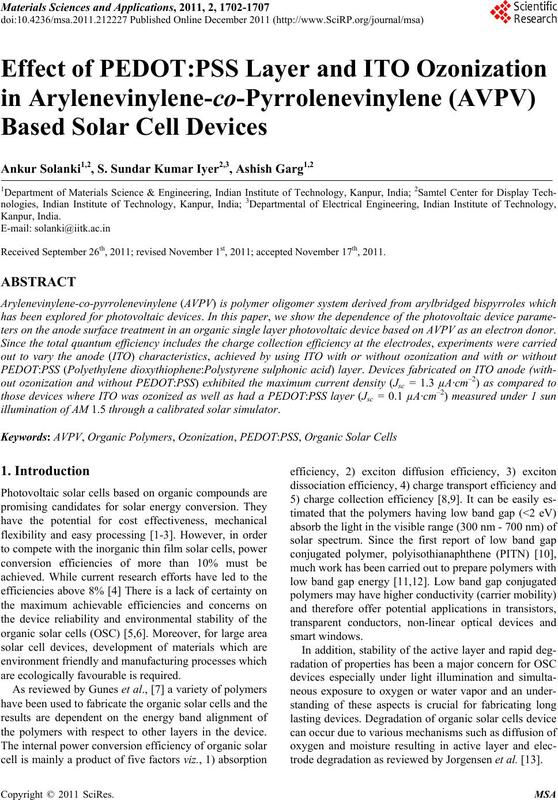 Solar Cells,” MRS Bulletin, Vol. 30, 2005, pp. 20-22. Physics Letters, Vol. 411, No. 1-3, 2005, pp. 138-143.